Long years ago we made a tryst with destiny and now the time comes when we shall redeem our pledge not wholly or in full measure but very substantially. At the stroke of the midnight hour, when the World sleeps, India will awake to life and freedom. A moment comes, which comes but rarely in history, when we step out from the old to new, when an age ends and when the soul of a nation, long suppressed, find utterance. It is fitting that at this solemn moment, we take the pledge of dedication to the service of India and her people and to a still larger cause of humanity. With these lines of Pt. 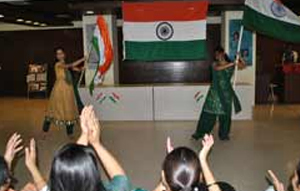 Nehru, we Asianites at Asian Business School celebrated Independence Day on the eve of 15th August, 2013. ON this auspicious day we were given the opportunity to pay homage to our great national leaders and freedom fighters, who had sacrificed their life and shed their blood for the freedom of our mother land. As per the theme of the event all the students at ABS were ethnically dressed in the colour theme of our national flag, saffron, white, green and blue which signifies courage, truth, prosperity and laws of righteousness. It was interesting to see students actively taking part in the occasion. Various dance numbers on the songs like ‘Ganpathi bappa moriya’, ‘rang de basanti’, des mera rangeela’ were performed. Many motivational and inspiring speeches were delivered to carry on and inculcate the true spirit of nationalism and the patriotic songs sung were the highlights of the day. The celebration was concluded with National Anthem and distribution of sweets to embark the spirit of Nationality and Patriotism in the country.